1. How long does my employer have to deliver my last paycheck after I quit or am terminated? 2. If I give my employer a two-week notice of the date of my termination, can my employer fire me before the end of those two weeks and not pay me? 3. I have accrued vacation time/sick time/personal leave days that I will not use before leaving my company. Is the company required to pay me for that time? 4. My employer refuses to give me my last paycheck. What can I do? 5. My spouse recently died. Is their employer required to pay their final paycheck? 6. Who enforces the law? 7. What are the remedies available to me? 8. How can I file a complaint / how long do I have to file? Generally, the employer has a reasonable time to pay you your last check, usually within 30 days. The most common requirement is that you be paid by the next payday when you would have been paid. Some states may require that the employer pay you within a shorter or more specific period of time, either immediately or within a few days of discharge. There can be different requirements depending on whether you were fired or you quit voluntarily: some states require terminated employees to be paid immediately, while those who resign must wait until the next payday. For more information on state final pay requirements, please see our page on Resources: State Government Agencies. At our site's listing of state government agencies, you can find the contact information and web links for the agency in your state which oversees state wage and hour laws, including final pay requirements. Yes. Most employees, unless under a contractual agreement, are employees at will and can be terminated at any time. Generally, companies will honor the two-week notice and pay the employee for the last two weeks even if the employer does not allow the employee to work during that time period. However, there is no federal law which requires the employer to pay employees or even allow them to work during that two-week notice period. It depends on your employer and where you live. 24 states—Alaska, Arizona, California, Colorado, Illinois, Indiana, Kentucky, Louisiana, Maine, Maryland, Massachusetts, Minnesota, Nebraska, New Hampshire, New York, North Carolina, North Dakota, Ohio, Oklahoma, Pennsylvania, Rhode Island (after one year of employment), Tennessee, West Virginia, and Wyoming—and the District of Columbia have laws regarding payment of accrued vacation time. However, in those states, you are only given a legal right to challenge an employer over unpaid accrued vacation time in your final paycheck if the employer has promised payment of unpaid accrued vacation time in your final paycheck. In the rest of the states, there is no state law that requires your employer to pay you for accrued vacation leave, although your employer may do so voluntarily, or may have to do so if required by a policy or contract. Unless required to do so under an employment contract, collective bargaining agreement, or other legally binding agreement, an employer is not required to pay employees for accrued sick time or personal leave when they leave their employment. In this respect, accrued sick time is unlike accrued vacation time which, in some states, must be paid as part of an employee's final paycheck. Some employers do pay employees for unused sick time, possibly as an incentive for employees to not misuse sick leave. However, this practice is generally completely voluntary, unless required by a contract as discussed above. More companies are moving to a "paid time off" (PTO) system where days off are not designated as vacation leave, sick leave, or personal leave, to give employees more flexibility and to ease the administrative burden of tracking and policing workers' use of their time off. Where this is the case, remaining PTO days are generally treated the same as vacation days under the law. These days are considered to be accrued by the employee and payable when the employee leaves the job. As mentioned above, your employer has a reasonable amount of time, or a set time period, governed by state law, to give you your final paycheck. If that date or a reasonable amount of time has passed, then you should contact a government agency and/or a lawyer in your area to help you determine how to proceed. If you are only owed the amount of your last paycheck, the amount may be too small for a lawyer to pursue a case against your employer on your behalf, but there are federal and state government agencies that can help you, even if you do not have a lawyer. If you do not get the help you need from the agencies you contact, small claims court is also an option. Because of the small amount of money involved, you may be able to pursue a claim against your employer more quickly and inexpensively in small claims court, and you may not need a lawyer. Yes. In this situation the paycheck would be issued to either the employee’s beneficiary or the executor of their estate. In some employment contracts a beneficiary is listed for this reason. The Fair Labor Standards Act, the federal wage standards law, is enforced by the Wage-Hour Division of the U.S. Department of Labor. Wage-Hour's enforcement of FLSA is carried out by investigators stationed across the U.S., who conduct investigations and gather data on wages, hours, and other employment conditions or practices, in order to determine whether an employer has complied with the law. Where violations are found, they also may recommend changes in employment practices to bring an employer into compliance. If you need further information about your state's last paycheck law and/or wish to report a potential state law violation, then you may wish to contact the agency in your state which handles wage and hour/labor standards violations, listed on our site's state government agencies page. Wage-Hour may supervise payment of back wages. The Secretary of Labor may bring suit for back wages and an additional penalty, called "liquidated damages," which can be equal to the back pay award (essentially doubling the damages) if an employer willfully violated the statute. An employee may file a private lawsuit for back pay and an equal amount as liquidated damages, plus attorney's fees and court costs. An employee may not bring a lawsuit if he or she has been paid back wages under the supervision of Wage-Hour or if the Secretary of Labor has already filed suit to recover the wages. The Secretary of Labor may obtain an injunction to restrain any person from violating FLSA, including the unlawful withholding of proper minimum wage and overtime pay. Your state wage payment law may have different methods for recovery of unpaid wages, and different remedies to be awarded to those who succeed in proving a violation. For further information, please contact the agency in your state which handles wage and hour/labor standards violations, listed on our site's state government agencies page. To file a complaint for unpaid wages under the FLSA, you may either go to the WHD, which may pursue a complaint on your behalf, or file your own lawsuit in court (which may require you to hire an attorney). Do not delay in contacting the WHD or your state agency to file a claim. There are strict time limits in which charges of unpaid wages must be filed. To preserve your claim under federal law, you must file a lawsuit in court within 2 years of the violation for which you are claiming back wages, except in the case of an employer's willful violation, in which case a 3-year statute applies. However, as you might have other legal claims with shorter deadlines, do not wait to file your claim until your time limit is close to expiring. You may wish to consult with an attorney prior to filing your claim, if possible. Yet if you are unable to find an attorney who will assist you, it is not necessary to have an attorney to file your claim with the state and federal administrative agencies. Your state wage payment law may have different deadlines for recovery of unpaid wages. 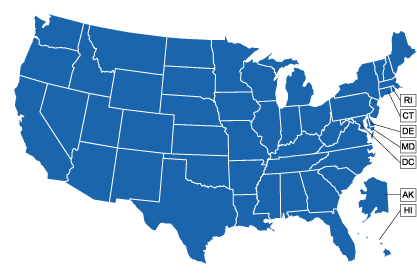 For further information, select your state from the map below or from this list.